Amazon's Choice for "rachel ray cookie sheet"
Offering three popular-sized baking pans, the Rachael Ray Nonstick Bakeware 3-Piece Cookie Pan Set is ideal for making both savory and sweet treats. Rachael Ray sure knows how to make baking easy and fun. 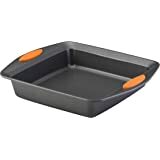 These cookie pans are made from durable steel that resists warping and feature long-lasting nonstick that provides excellent food release and easy cleanup. 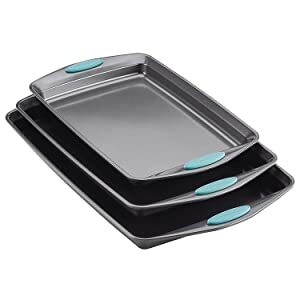 With a small, medium, and large cookie sheet, enjoy the convenience of three sizes to do everything from roasting stuffed eggplant, broiling cheesy garlic bread, or baking Rachael’s Ranch-Style Potato Skins and yummy Kahlua Chocolate Chunk Cookies. 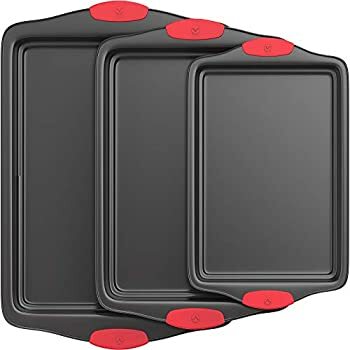 The cookie pans feature bold-colored, extra-wide grippy handles that provide a confident grasp when pulling items from the oven and are oven safe to 500°F. 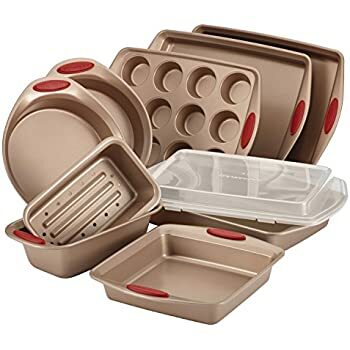 These versatile cookie pans are the perfect complement to many other pieces in Rachael's bakeware and cookware collections that always spell fun in the kitchen. 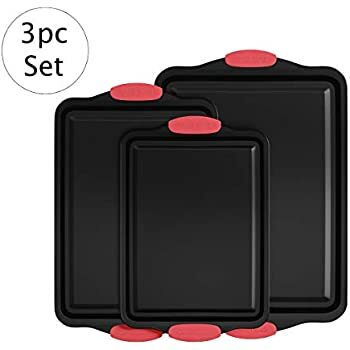 Hit a sweet or savory triple out of the park with the Rachael Ray Nonstick Bakeware 3-Piece Cookie Pan Set that includes three durable pans for creating delish baked foods. 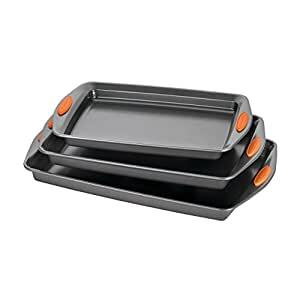 Offering three popular-sized baking pans, the Rachael Ray Yum-o! 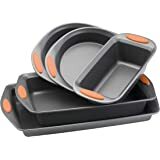 Nonstick Bakeware 3-Piece Oven Lovin' Cookie Pan Set is ideal for making both savory and sweet treats. These cookie pans are made from durable carbon steel that resists warping and feature long-lasting nonstick that provides excellent food release and easy cleanup. 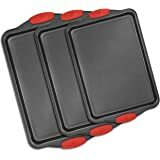 With a small, medium and large cookie sheet, enjoy the convenience of three sizes to do everything from roasting stuffed eggplant, broiling cheesy garlic bread, or baking Rachael's Ranch-Style Potato Skins and yummy Kahlua Chocolate Chunk Cookies. 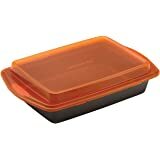 The cookie pans' bold-colored, extra-wide grippy handles provide a confident grasp when pulling items from the oven and they are oven safe to 450DegreeF. As an added bonus, a portion of the proceeds from this purchase goes to Yum-o!, Rachael's nonprofit organization that helps kids and their parents develop healthy relationships with food and cooking. 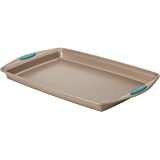 These versatile cookie pans are the perfect complement to many other pieces in Rachael's bakeware and cookware collections that always spell fun in the kitchen. Hit a sweet or savory triple, with the Rachael Ray Yum-o! 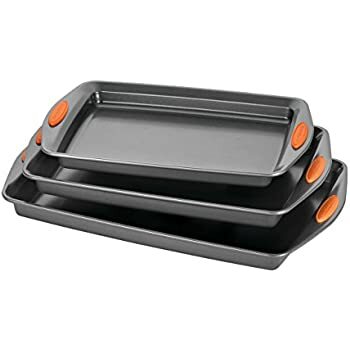 Nonstick Bakeware 3-Piece Oven Lovin' Cookie Pan Set that includes three durable pans for creating delish baked foods. 3.0 out of 5 starsLooks nice, but is it? 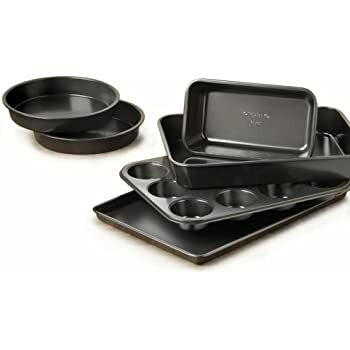 I just received this pan an the the 3-Piece Baking and Cookie Pan Set of the same brand. My wife ordered these right after she tossed out my old "expensive' set because they had the yellow residue of cooking spray on them and they didn't look nice anymore. 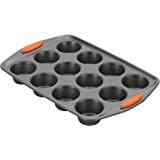 As a former kitchen cook and engineer, here are my first impressions. 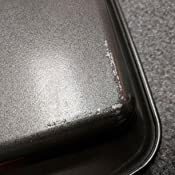 The pans feel nice, slick, not too thick or thin. They are aesthetically pleasing. I haven't used much on them to see how they hold up to cooking various things. We shall see. The first thing i did was wash the factor chemicals off the set. I had read in the other reviews that these are prone to rusting. So I washed them by hand and left them to dry in the dish rack. In the morning I was to place them in storage and I immediately noted why these are prone to rusting. The curl around the outer lip was not sealed, i could hear water swishing around inside despite my best efforts to drain it. I will have to drill a drain hole to counter act this poor design. I can all be assure you that the coating was applied after the lip cure, so that means the inside will probably rust anyway. Right now I have the set in the oven to evaporate any moisture. I will update this review after a month of use. Let's see if i add to t he list of Pro's or Con's? 1.0 out of 5 starsDon't waste your money! 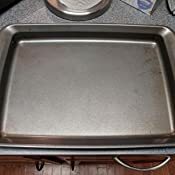 I wanted to wait before I wrote my review...i bought these in September so here goes....dont waste another dime on anything but stainless steel....i always bake with parchment paper and the parts that weren't covered turned dark brown, you can't get it off! The orange rubber thingys on the handles keep coming off....the high reviews are either because they received the products free or discounted OR I received some sort of knock off. And it makes no difference to hand wash or use the dishwasher. I've only used the smaller pan six times. The inset silicone handles turned from a bright orange to a yucky brown. The non-stick coating worked well the first two times, but seems to have oxidized and turned brownish. The coating has started to turn brown on the back and chip off. The pan has only been hand washed. Lastly, they immediately warp as soon as they get hot. I bought these Feb 2017, it is now Sept 2017. Long story short, the non-stick coating is peeling off and sticking to the food. Yuck...keep shopping! 1.0 out of 5 starsPans leak rusty water from silicon handles after washing. These are the most annoying pans I have ever owned. They come with an added "feature" of holding rusty water in a hidden compartment. 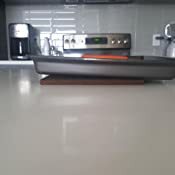 Every time I pull them out of the diswasher, rusty water comes out from the silicon handles leaves an ugly brown water spots everywhere in the kitchen. I guess those people giving these 5 stars don't wash their pans. 5.0 out of 5 starsGreat pans! 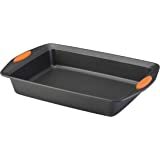 Nice pans, thick construction and a thick VERY non-stick surface (Burned cheese...No problem! ) They have high sides which helps with flipping my fries & tots. 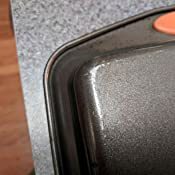 I have used each pan about 6 times so far and there are no issues, the non-stick surface is holding up well and there are no signs of rust. The pans do have a bit of warping but not too much to be an issue for me. Mostly the warping occurs with the largest pan. With the great coating clean up is super easy. So far I've only used hand washing and then dried immediately without issue, I think hand washing is best to prevent any rusting. No issues to report about the silicone inserts, Soft and intact. Price-performance ratio on these is great, I recommend. We've had these for about 6 months. The largest of the 3 pieces bends when used under normal heat. It comes back to its normal shape when it cools. It did this from the beginning, although it took us a while to use it and discover the problem. Also, when hand-washed, color drips from the orange plastic on the side, and the colored water has a metallic smell. These pans have performed admirably. I have baked with them regularly for 2.5 months. A principal use has been for baking salmon filets at 425 degrees for 15-20 minutes with the skin side down. Also, for baking oiled and seasoned potato slices. I hand wash the pans with nothing but some dish detergent and a sponge. The pans have been COMPLETELY nonstick. 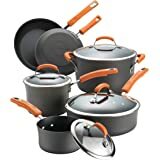 With regard to warping, each pan warped the first time or two I used them, but none have done so subsequently during repeated use.